Seriously, I could eat this whole plate of goodies. Warning, long post (article) ahead! Parties. There are more kinds than you can “shake a stick at” from hoe-downs and backyard barbecues to formal weddings and balls. Most everyone loves to attend one, and not everyone loves to throw one. Understandably so, since throwing a large or complicated party can be intimidating to say the least, and there can be some expense involved as well. No matter what kind, there’s no such thing as a completely stress-free party…unless it’s someone else’s! But having said that, I love to throw parties. I’m not one to do it too often, but when I do, I want the food to be delicious and I want everyone to have a wonderful time. I’ve also learned the very important art of having a great time at my own parties. All it takes is a little, or a lot of—planning. At the end of August, we threw a party while on vacation to visit my mom. The occasion was a significant birthday for her, and because we love her and wanted to do something special together, my husband and I decided to host a celebratory party in her honor and invited some of her close friends. Ours was to be a cocktail and hors d’oeuvres party at her home, with yours truly doing all of the food and hubby tending the bar. I’ve made food for a lot of parties…parties that didn’t require more than a phone call invitation like dinner parties, deck parties, pot-luck parties and Sunday night suppers, and larger parties where I had some help, but never a cocktail party of this nature. I wanted this party to be reminiscent of cocktail parties from days gone by, with mailed paper invitations, lovely food, lively conversation and drink. In my mind’s eye this party would require delicious small bites of food that could be easily consumed with one hand, while holding a festive drink in the other. So in order for me to successfully play the caterer, I had to do some research, and in the process I learned a lot and had fun making everything, too. And the most gratifying part? It was a huge success! Everyone had a great time, hosts and honoree included, and the food and cocktails flowed freely and plentifully. Now that I’ve returned home triumphant and patted myself on the back, I thought it might be fun to share with you a few of the tips and tricks that I learned while planning and executing this party, especially with the holiday party season rapidly approaching! Some of these tips may seem like common sense, and some of you out there may have far more experience with this type of party than I did, or do now. But I can tell you that no matter what kind of party you choose to have, a few things will sneak up on you, so here are some good basics things to keep in mind that may help you throw a fun and memorable party of this type, too. The single biggest thing I learned is that planning is really key. As my husband put it, my pre-planning rivaled Napoleon’s battle strategy. 3 weeks or more ahead of party time: Figure out the basic party theme, guest list and event details, pick out an appropriate invitation and make sure it gets to the invitees well in advance. Seems like a no brainer, eh? But keep in mind that the invitation itself will set the tone. From the invite to the food, to the last drop of drink poured, your party should have the same look and feel throughout. Even the formality of the wording as well as the design of the invitation will set the stage in the minds of your guests. There’s a lot of great info on the internet about themes, ideas and wording, as well as a range of invitation options from printed and pre-printed versions to electronic ones. But for now, here are a few guidelines on wording that I found most useful. If your party is to be super casual, you can use all conversational and casual language. If you want your party to be a nicely dressed one, but not formal, keep the wording somewhat casual, but traditional. If you want the party to be formal, you need to use formal language (as for a wedding), and indicate dress requirements like black tie only or optional if that’s important, or cocktail attire if it’s a truly formal cocktail party. And if it’s a costume party…well, you’d better let folks know that up front, and whether or not a costume is mandatory. As for other pertinent information, if you want a hard start and end time, you need to put a time range on the invite. If it’s a party that suggests gift-giving, but you don’t want guests to bring gifts, you need to add that wording in a pleasant, but concise way. And of course, make sure to include the theme of party, the honoree (if it’s that kind of party), date and time, name of the hosts, the address of the party and RSVP or Regrets information with a phone number and email address for less formal parties. Choose your weapon…um, theme…for your cocktails. If you have deep pockets or have more than 20 people coming for cocktails and food, you need to hire or engage help. It’s just too hard to keep more than 20 folks supplied with food and drink AND be hosts of the party, in my opinion. But for 16-20 total, it’s quite manageable if you streamline just a bit. For instance, choose one or maybe two different cocktails to make, and then plan to have wine and/or beer. You can also have on hand some scotch, bourbon and gin with basic mixers, and do definitely have some non-alcoholic options for those not imbibing that evening. Rather than mixing, you can choose to make pre-mixed drinks in pitchers that you or your guests can pour such as Bloody Mary’s and Screwdrivers, which are both made with vodka. Bellini’s and Mimosas are other good options for which one can pour the base juice or mixture from a pitcher and then top with sparkling wine or champagne. Or you could do a punch instead…you get the idea. The main thing is to keep it manageable. What you don’t want to do is mix complicated cocktails for 16 people…unless you’re a professional bartender and a glutton for punishment. Our featured cocktails were the classic original Champagne Cocktail, Kir Royale, and Italian Spritzer, all with just 2-3 ingredients and easy to prepare, and I’ll share those recipes with you at a later date. We found a very decently priced and mixable champagne to use and tested, tested, tested ahead of time. That testing is VERY important, don’t ya know? Plus we offered wine and the liquors with basic mixers that I mentioned above. Plan the menu, how much food you’ll need per person and what can be made ahead…and do make some food ahead! When you’re doing all the food yourself for a party it’s essential to plan some foods you can make in advance. I use this tip for ANY party, much less a cocktail party with fancy food. And particularly with small bites, you’ll save yourself some agony in the end. Just make sure that what you plan to freeze, freezes well and the flavors or textures are not destroyed by the process. Also, it’s not a bad idea to test the food you plan to make in advance if you haven’t made it before, making sure of whether it needs to be served hot, room temp or cold. I tested everything…I mean, we HAD to have something to eat with all that cocktail testing, my goodness! General guidelines for how much food you’ll need are as follows: For an early cocktail party before dinner, you should plan on 3-5 different items, 2-3 pieces of each item per person. When the cocktail party is in lieu of dinner, you’ll need to increase that amount to 8-10 different items, 4-6 pieces per person. Though none of my pictures came out too well, this is my final table of food. Clockwise from the bottom front: Cornbread tartlets with BBQ Pork, goat cheese stuffed tomatoes, bacon wrapped dates, tarragon chicken salad on brioche crostini, caramelized shallot and blue cheese dip and veggies, crab cakes with lemon chive aioli, mini cupcakes and cheese olive bites. The dining room walls were painted by my mom when I was a child…aren’t they pretty? Marching Orders: Make a cooking and plating schedule, and plan how you want to serve the food. This is a big deal. Make notes, mark off what you’ve accomplished as you go. Then make notes again. On the day before and the day of the party, have a very detailed “to do” or “to cook” list and get it done. Since several items on my menu were made ahead and brought with us, I planned when I needed to finish, thaw or heat them just before the guests arrived. The day before the party I planned to make the filling for the tomatoes and hollowed them out, make the dip and prep the crudités, make the chicken salad and the cupcakes. The morning of the party I’d cut out and toast the brioche, stuff the tomatoes and select all my serving dishes early in the day, then bake and finish items in the early afternoon, composing and plating everything just before our guests arrived. 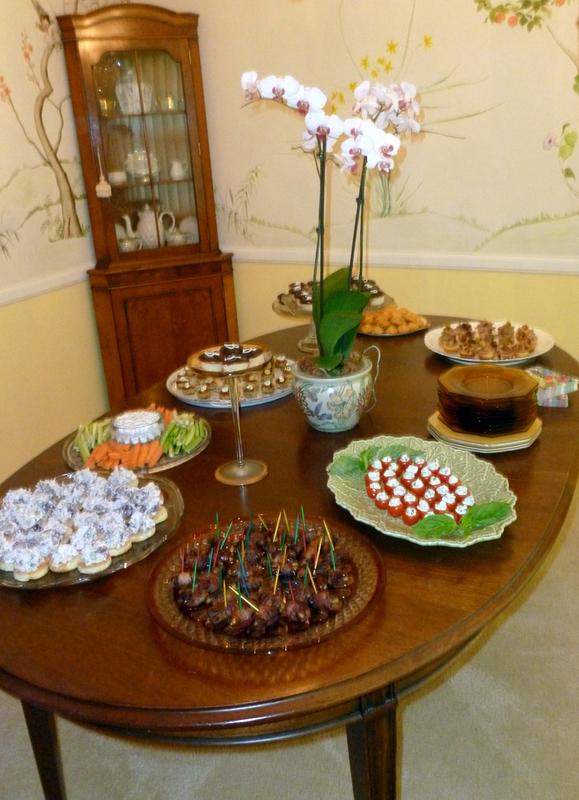 I realized early on that trying to pass trays of hot hors d’oeuvres myself would make it impossible for me to interact with the guests as a hostess and facilitate getting drink orders, so I made it all buffet-style. 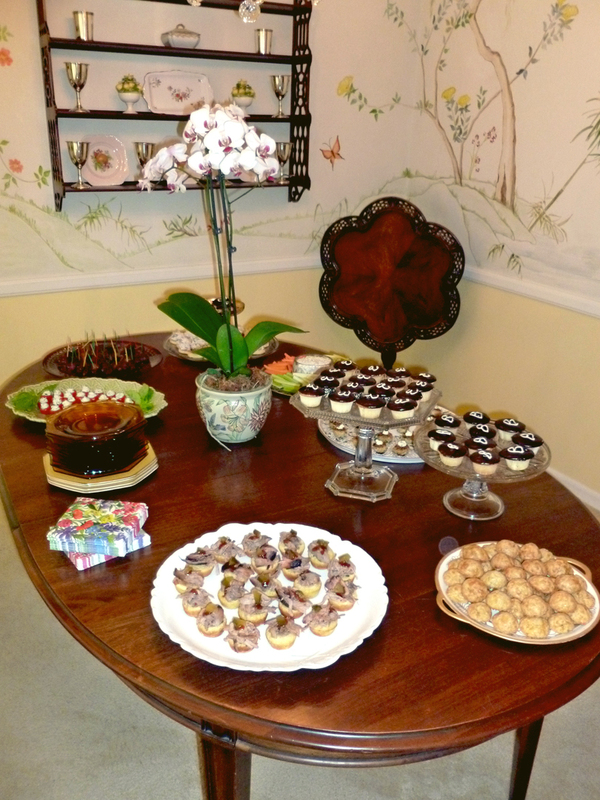 When serving a buffet-style cocktail party where all the food is on a table, it’s nice to have items at different heights and on serving pieces that enhance the look of the food, if possible. Ours was fairly simple affair using pretty platters and some antique dishes we already had. And due to my lack of experience in plating small bites, I jettisoned the idea of highly decorated platters in favor of getting it all done and plated on time. It was a good move for me, and next time I’ll know how to time any additional plate decor, if necessary. Just remember, the composing and plating takes the most planning, is the most last minute and time consuming, so keep it realistic for yourself. It’s good to have a helping hand if you can enlist someone close by (husband). Last minute strategies: Table decoration, serving pieces, glassware, napkins, toothpicks, drink garnishes…and ice, oh my! You’ve got it all planned and it’s the day of the party…did you forget anything? Having enough serving pieces available for each of your food items, toothpicks to go into “picked” items, enough cocktail napkins for cocktails and food, enough plates for guests and plentiful and appropriate glassware, cocktail garnishes at the ready, some flowers for the table if desired, and ice, are important to think about ahead of time, too. Maybe your food is the only decoration you’ll need, or maybe you’ll decorate your spaces and table to the hilt. But if what you desire are some flowers for the table, it’s a good idea to use a tallish flower arrangement, or in our case it was a single beautiful orchid plant, which elevates the floral element away from the food, allowing the food to visually stand on its own, as well as keeping foliage out of the way. That’s a good rule of thumb, and something else I learned while researching. View 2: The entrance to this room is upper right and the room is small, so placing the plates and napkins more towards the center helped keep guests flowing through the door and around the table. Alas, the autofocus on my camera wasn’t cooperating that night and I was in a hurry, but at least you can get an idea. And that’s it, my friends. With lots of planning and great help from my husband, I was able greet our guests with a cocktail in my hand! I do hope you’ll find some of these tips useful in your party planning this holiday season. Oh, the recipes? Since my post is so long already, I’ll share the recipes for the first two menu items with you today, then share the rest plus our cocktails in a subsequent posting. Cheers, live long and and may you happily party on! There are so many variations on these 50’s styled bits of goodness, but I think a little spice is nice. The olives provide all the salt you’ll need in these super easy hors d’oeuvres, which surprise and delight guests when they bite into them. They can be served hot, warm or at room temp, and the unbaked dough freezes beautifully. Because of that, I like to keep some in the freezer to have when I need them! 48 plus small manzanilla olives (pimento stuffed green olives), drained and patted with a paper towel. Preheat your oven to 400 degrees F if you’re planning on baking these right away. Cover a cookie sheet with aluminum foil, or you can use a Silpat if you prefer. In a medium-sized bowl, combine the cheese, flour, cumin and cayenne until well-mixed. Add the softened butter and mix it into the dry mixture with your hands until a dough forms. Scoop teaspoon to marble-sized pieces of the dough and flatten them into the palm of your hand, making a small disk just large enough to encase an olive. Place an olive in the center of the dough, then wrap the dough around the olive until it’s sealed and ball-shaped. Place the ball on a cookie sheet. Repeat until all of the dough is used, spacing the balls about an inch apart. At this point you can bake them right away, refrigerate for a while and then bake, or freeze the dough on cookie sheets, and then store the frozen balls in a freezer bag for baking at a later date. If you’re baking these immediately, place the cookie sheet with the dough into the 400 degree oven and bake for 15-20 minutes, watching carefully, or until the dough is lightly browned and firm to the touch. Transfer the bites to a wire rack to cool slightly. Serve warm or at room temperature. If frozen, they’ll keep about 4-6 weeks in the freezer. When ready to bake, allow the dough to thaw a bit while the oven preheats. You may need to bake them about 5 minutes longer when they’ve been frozen, but it depends on how much they’ve thawed. Just watch them. This is a Martha Stewart recipe that is super simple and makes 32 pieces, but can be easily adjusted to make as many as you need. Click the live title link for the recipe. These can also be made ahead, frozen and then baked at the same temperature as the cheese olives, so they’re good companions for a party. I have some of them on hand in the freezer sitting next to the cheese olives! One quick tip: mine did not take as much time to bake as Martha says, and you need to watch them carefully so the bacon cooks through, but doesn’t burn. Don’t use thick cut bacon because it won’t stay wrapped or cook through. This entry was posted in Appetizers, Cocktail Nibbles, Food and tagged Appetizers, bacon wrapped dates, cocktail parties, Cocktail party food, Cocktail party tips, Hors d'oeuvres, make ahead party food, party planning, party themes, retro appetizers, Retro cheese olive bites by bitsandbreadcrumbs. Bookmark the permalink. You are definitely a planner and an organizer. That was quite a party and a successful one too. Congratulations! Happy belated birthday to your Mom. Never did it with pistachio… Yum………. Thanks, yummy, I really appreciate that comment! It was long and I’d like to think it was helpful! Gosh, Charlie, and I was just thinking of you when I was writing this, and how I was so out of my league in terms of cooking for and planning parties…you’re a pro! I wish I could be there to help you, too. I know you’ve had a surreally busy week, and I’m on my way to catch up on today’s but did see the amazing Rainbow Fish on FB. Hang in there and simplify, simplify if you can. Thanks for taking the time to comment! 🙂 Mom had a blast…it was all worth it. Thanks, miss c. But I know better than thinking your party days are over…all your animals are party animals, I’ll bet! 😉 Swanning about…love it! I’m keeping that one. I think your husband is bang on — your preparation really does rival Napoleon’s battle strategy. Wow, I’m exhausted just reading about all the work that went into this celebration. Mum’s are worth the effort though. She’s lucky to have such a thoughtful daughter Betsy. I’ll be refering to your tips next time I host a gathering, since you’ve done all the legwork for us! You certainly deserve to sit back and enjoy a glass of your favourite wine tonight, no that this is behind you and you’ve posted on it. Thanks, Barb! 🙂 The party took some work and planning, but totally worth it. And now that I know how to think about approaching this type of party, it’ll be easier next time for sure. I’m saving my glass of wine for tomorrow night, but good idea! Glad you found this interesting and hope it’s useful in the future. Your planning paid off in spades, Betsy! Delicious food, gracious hospitality, pleasant conversation all made for a delightful evening. I’m glad you are posting the recipes, too. The food looked wonderful. If those press glass cake stands could talk, I bet they could tell us about all the parties they have attended the last 100 years. Thanks for sharing your pictures. I know your mother must have been thrilled and that everyone enjoyed all the food that you prepared. Good job!. We all had a really great time and yes, mom was pretty thrilled. I’m so glad we had the party and that we did it ourselves…a gift of self so to speak! Thanks, Karen. You had it right when you said weapon. Great advice and great spread. No need to apologize for a long post when it’s as chockfull of such great advice, Betsy. It’s hard enough to plan a successful party in one’s own home. To throw one in another home and town is an entirely different matter. “Be prepared” is the order of the day and you certainly were. I bet your Mom had a wonderful time and really appreciated your efforts. Have a great weekend Betsy!! What a wonderful party! 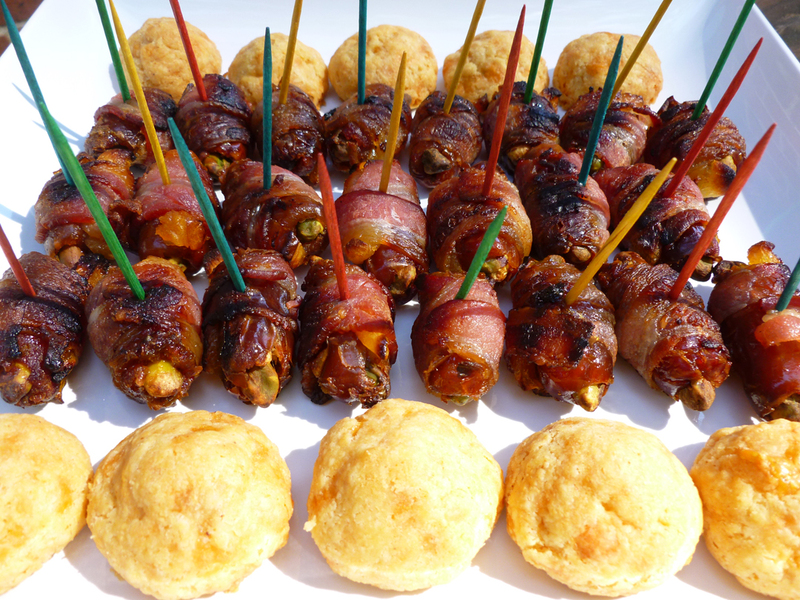 That last photo of the bacon wrapped dates still has me drooling. Thanks, Maureen. That is a grand recipe, though I’m often not so fond of Martha Stewart recipes. 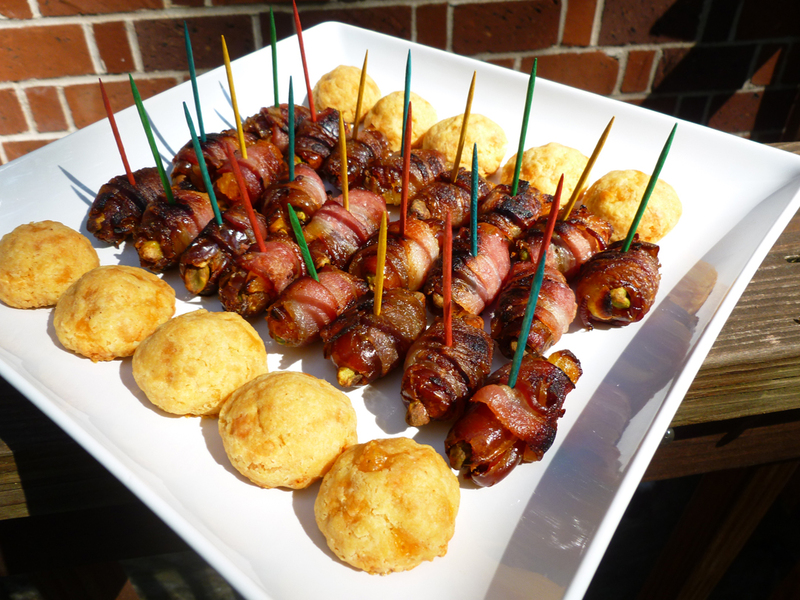 This one has tons of flavor…some people even thought it was steak instead of dates! Everyone loves them. What a great (and oh so useful) post. You really do need to put so much thought and planning into a party and how you want it to “flow” – I do hope you managed to enjoy the party and I am sure your mother had an amazing time! Thank you so much, Claire, I’m so glad you enjoyed it. I know there are some folks…and some of our friend bloggers are amongst them, that could probably have whipped up that whole menu in a day or so, but my advice is for the rest of us! 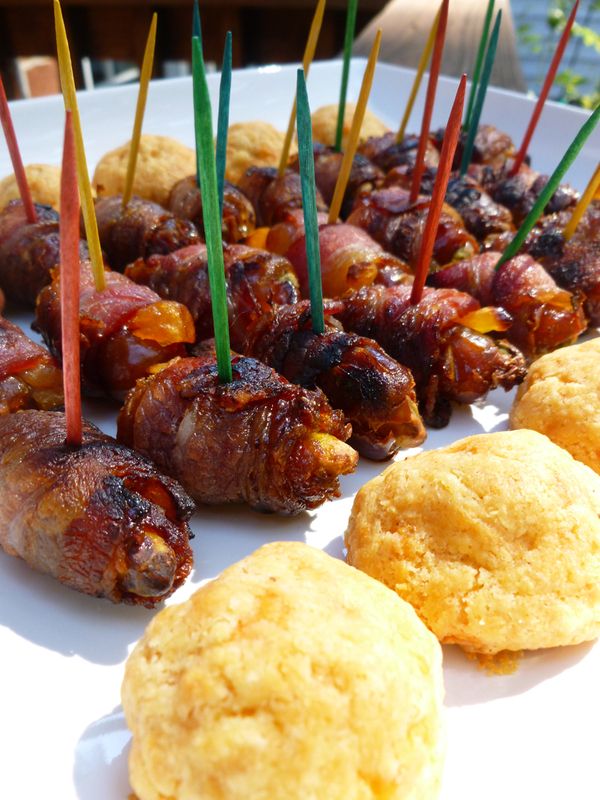 😉 I’ll be posting more recipes soon, and I’m so glad you liked the cheese bites…they are awesomely addictive. Fantastic Betsy! A perfect post for the upcoming holiday season. But I think I might hold an appetizer night before holiday season, just for the fam. I love a dinner of apps and these look so delish! Oh you warm my heart Betsy. I thought I was the only one who began a sentence with the word “Hey” 🙂 My daughters tease me about this. And so glad you loved the brownies. I just cannot make them anymore lest I weigh 500 lbs! I am so glad you did this Betsy. I love throwing parties but I don’t think I freeze as much ahead as I should and knowing that you did it and it worked really helps me. Everything looks fabulous! Your mom must have been so happy. Happy Belated Birthday to your mom! I give one party a year, Betsy, not being a party girl. It is a Christmas music party. I prepare for it the day before. The refreshments are bread, soup and Christmas cookies. I generally make two kinds of yeast bread and two soups, trays of whatever Christmas cookies we’ve started to make and have pots of tea on hand. But next time I need to do another kind of party I’m going to make your olive bites and serve champagne cocktails (I have a bottle of Kir). Big parties are tough to do too often, both for the host and the pocketbook. I like your idea of a soup, bread and Christmas cookie party…I’ve done many a chili party myself. The cheese olive bites are wonderful for any occasion and since they freeze so well, you can keep them and pull them out whenever you like…they’d be good with your soup party, too, I think!